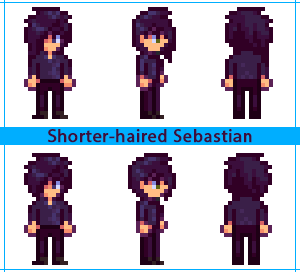 Sebastian's edited sprite with a shorter side-bang. Wanted a better looking Sebastian and his really long side-bang was awkward-looking so I reduced it on his sprite. You could probably find a matching portrait to go with this as I've seen several really great ones!
. This mod replaces the original Sebastian.xnb sprite. Please make a backup of the original file if necessary.
. Unzip or extract the Sebastian.xnb file after downloading.
. Place the file into the Stardew Valley folder under Content\Characters and replace Sebastian.xnb.